The context here is the measurements of Shielding Tensor of protons in solid-state single-crystal specimen. The experiments yield the values of the components and the direction cosines of the principal directions of the Tensor. Further after, In order to obtain the information on the molecular electronic properties (in the case of single crystals of organic molecules) it becomes necessary to properly account for the near neighbor inter molecular contribution to the shielding at a given site; and the bulk susceptibility contribution to the induced fields at this site. Thus, the subsequent processing, required after obtaining the experimentally measured values, has been a discouraging factor in the HR PMR studies using the multiple pulse line narrowing techniques. This has relegated such HR PMR studies even more because of the current day advances in the multi nuclear multi dimensional techniques and the corresponding improvements in the spectrometer features. However, in spite of all such trends and improvements there has been no unequivocal evidence(1) that there would not be situations arising when a structural characteristic can be established only with the HR PMR measurements also made for conclusive evidences. Such situations may not be a routine these days, but still there is a necessity to provide a protocol for the processing after the experimental measurement (2). An enumeration of the results till now is intended in this contribution envisaging a protocol for measurements by HR PMR using multiple pulse line narrowing technique. The various steps taken till now to obtain clarifications(3) on the accounting of bulk susceptibility contributions(4) are enumerated systematically realizing a protocol which would be valid for any shape of the specimen of all molecular systems for which a single crystal can be obtained(5). 1. The sample is of arbitrary Shape. effects as described in Sheets #7 and #8 of this display. of the measured Shielding Tensor. dependent contributions from the result of step 4 above. The materials for presentation in IBS2009 are based essentially on the materials of the IBS2007. This author could not attend the IBS2007 due to turn of events beyond control hence the materials remained unpresented. The Poster materials of IBS2007 can be viwed from HERE,..Click! By using the Full Tensor Form of the equation for the aromatic ring current shifts in the , it has been possible to show (1) that there are definite advantages of calculating the full shielding tensor for such cases of molecules in motion, rather than merely using the equations for the isotropic shift values. However, in the model calculation presented (2) equal weights were given for the shift values sampled at the several instantaneous dispositions during the motion while arriving at a average value. Conventionally, an oscillatory motion (torsion) is satisfactorily taken into account on the basis of the characteristics of Simple Harmonic Motion. In such a case the characteristic resident time for the molecule at a point during the oscillation can determine the weight factor. Such criteria if it gets built in to the averaging procedure, then the results could have better confidence indices. An approach of this type would be illustrated and to whatever extent possible a comparison with the approaches as in Reference (3&4) would be presented. Indications to the observable trends in the chemical shifts become evident in the results obtainable in tabular form and or graphical plots. SHEETS-01 to 03 consist of excerpts from an early application of isotropic ring current shift values to the context of macromolecular fluctuations. SHEET-04 describes the efforts initiated for the calculation of FULL TENSOR instead of only the trace. Display SHEETS 05 to 09 contain the results of a calculation as per the considerations of SHM weight factors discussed in the Previous SHEET-03. SHEET-09 consist the essential results as can be summarised till the present. 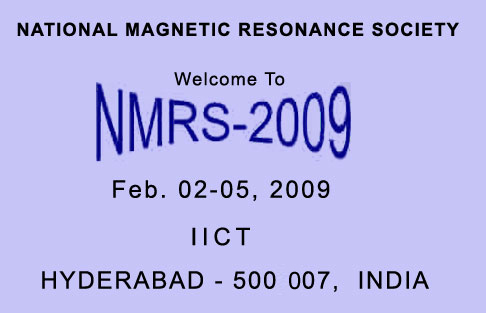 The induced transitions, in presence of the electromagnetic radiations in the Radio Frequency region responsible for Nuclear Quadrupole Resonance (referring explicitly to NQR at zero external magnetic field) are magnetic dipole transitions in nature as much as the NMR transitions are. But, the energy of interactions which cause the energy level splitting in the two cases are different. In the case of NMR it is the magnetic dipole vector interacting with the External Magnetic fields (external to the sample containing the ensemble of spins) which causes energy level splitting. On the other hand the basic interaction for the NQR is the Nuclear Quadrupole Moment Tensor with the Electric Field Gradient Tensor within the specimen, but external to the particular nucleus. The classical vector precession picture can be conveniently used to convince in the Chemistry class rooms to get convinced about the parameters which are relevant to chemists. But a similar visualization is not possi9ble for NQR as can be found from several sources. Efforts were made to use the classical vector description for the Bulk Magnetization in the context of NQR, but the classical vector description of the type of nuclear spin precession to describe NQR phenomenon is totally absent. It is because the nuclear quadrupole moment is described and discussed under nuclear physics and the Tensor interactions are describable conveniently by mathematical expressions but visualization of �tensors� is not as easy as the visualization of �vector� quantities. In this paper the tensor interactions and the differences between Magnetic Field Vectors, and the Electric Field Gradient Tensors are being discussed by schematically representing the fields and field gradients in terms of the trends of the �lines of forces� representing the fields. Then the association of the magnetic moment with the spin angular momentum is compared with the difficult task of associating the spin angular momentum vector with the Nuclear Quadrupole Moment Tensor. After arriving at a �equivalent� description of an association of an effective line to represent quadrupole property (even though in reality such a line may not exist) that line is �supposed� to hold a fixed orientation with respect to the Spin angular momentum, by virtue of which a classical vector precession picture becomes tangible. And, this would really enable the necessary basics about the interactions in NQR to be grasped with an awareness as to why the descriptions cannot be as simple. Even though, even without such a study, pulsed NQR experiments are being performed and described in terms of density matrices and the utility of the phenomenon has been so well established. But the appreciation of the pulsed NQR experiments by the Chemists who use this technique remains only vague and elusive for the grasp. Hence descriptions as basic as that of dipole moments1 would be presented for the quadrupole moment to bring the phenomenon under better grasp. An indications to what this approach would be has been made available2 for viewing. SHEET-12 What is right and What is wrong with the Question in this Sheet ?